Of all India's states, Bihar is the one most intimately linked to the Buddha's life, resulting in a trail of pilgrimages which have come to be known as the "Buddhist Circuit". The very name Bihar is derived from the word vihara, which means Buddhist monastery. Bihar is also a religious center for Jains and Hindus. Despite having areas of great beauty and historic religious links, Bihar is India's poorest state, with a low per capital income. The literacy rate is one of the lowest in the country. And yet, the state is strategically located and naturally rich. Bihar has an international border with Nepal, and also borders the states of Uttar Pradesh, West Bengal, Orissa and Madhya Pradesh. The River Ganges flows across it from west to east. The Chotanagpur plateau in the south of the state produces 40% of India's mineral wealth. Situated on the west coast of India, the state of Gujarat is one of India's wealthier states with a number of important industries, particularly textiles and electronics. It has the largest petrochemical complex in the country. Gujarat was the birthplace of Mahatma Gandhi, the Father of the Nation. Gujarat is the former home of a majority of India's emigrants, particularly to Africa, the UK and USA. Around 40% of the Indians in New York area are estimated to be Gujaratis. Geographically, Gujarat can be divided into three areas. The eastern (mainland) region includes the major cities of Ahmedabad, Surat and Vadodara (formerly Baroda). The Gulf of Cambay divides the mainland strip from the flat, often barren, plain of the Kathiawar peninsula, also known as Saurashtra. Along the south coast are sites where many of the great events in Lord Krishna's life took place. 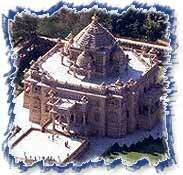 Gujarat is also a major centre for the Jains, and some of its most interesting sights are Jain temple centers. Though not a major tourist centre, the state is known for its rich masonry work, delicious cuisine, and handicrafts like mirrorwork and silver jewellery. The capital city of Gujarat is famous for the Akshardham Temple which has been built in the memory of Lord Swaminarayan. The most convenient Entry point into Gujarat is through the metropolis of Ahmedabad. Also known as the "Manchester of India'", the city is a busy textile centre. Old Ahmedabad has mosques with inspired workmanship, wooden Jain temples, unique stone stepwells and houses with ornately carved wooden balconies and window screens. Modern Ahmedabad, just across the River Sabarmati, is a showpiece of contemporary architecture, with designs by Le Corbusier, Louis Kahn and India's best architects. Ahmedabad is a convenient base for a number of excursions. This city is known for its textiles, zari work, and diamond cutting and polishing industry. The Tribal Museum (T.H.R.T.I.) at Bhubaneshwar (CRP Square) however is quite comprehensive and provides adequate information on the art, craft, housing and life-styles of the various tribal groups. This city is known mainly for its handicrafts: bead and mirror work, bandhani tie and dye fabric, silk embroidery and applique work. Mahatma Gandhi studied at the Alfred High School here. Once the capital of the princely Gaekwads, this is today a graceful city of palaces, parks, temples and museums.